This interview first appeared in Nursing Review, October 2015. Reposted with permission. Q. Where and when did you train? A. I was one of the young BN pioneers, going forth blinking into the bright new day for nursing education. In 1992, I joined the first intake of the undergraduate degree programme at Otago Polytech. After a gap year and some part-time study, I graduated from there in 1996. A. 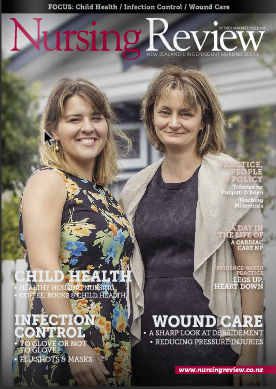 Prior to my current position, my most recent professional role was on the National Committee of the NZNO Mental Health Nurses Section, where I served as co-editor of our Head2Head journal. Q. When and/or why did you decide to become a nurse? A. Working in hospitality after leaving school, I found I enjoyed serving people. I also relished an intellectual challenge, completing a physics degree and a diploma in liberal arts at Otago University. The Bachelor of Nursing programme seemed to bring these two things together. But after graduating with my BSc(Hons), I sought above all a meaningful job I could put my heart and soul into. Friends and family more conditioned by gender stereotypes asked why I didn’t do medicine. But while volunteering at the Otago Community Hospice in 1991, I found the rewarding career I was looking for – nursing. Q. What was your nursing career up to your latest position? A. Providing direct care for mental health service users has been my passion. So I’ve spent my career at the coalface, in the community and in inpatient units in Auckland, London, Wellington and Melbourne. Q. In recent years you have stood for Capital & Coast DHB, Hutt City Council and now have been elected NZNO president? What has drawn you to seek public office? A. Working in mental health, as I have done, you see social exclusion up close. The reality of the social determinants of health is unavoidable. And as an NZNO leader, I have seen how the voices of nurses can be marginalised and ignored. In 1987, the World Health Organisation published Leadership for Health for All: The Challenge to Nursing. The strategy document said: “Because politics is the vehicle of policy making and social change, some nurse leaders will have to combine the gentle art of nursing with the rougher one of political activity”. I have stood for public office to respond to that challenge. I have strived to provide a voice for those who are under-represented, to focus public debate on the social determinants of health and to help people take action themselves for change. Q. What are you looking forward to most about your new nursing leadership role? A. I am looking forward to continuing to connect with NZNO members. I’m committed to bringing their voices, their issues and successes to the board table, so that our organisation is guided the membership. I am also excited about strengthening the bicultural relationship within our organisation, in order to support stronger action for Māori health. Q. What are you looking forward to least? A. See below, for what I’m reading instead of the interesting books gathering dust at my bedside. Q. If there was a fairy godmother of nursing what three wishes would you ask to be granted for the New Zealand nursing workforce? A. I would ask for safe staffing, so that nurses can deliver the care we dearly want to provide, and not go home utterly exhausted or in tears. I’d ask for pay equity – an end to the discrimination based on gender, ethnicity or sector – and for a supported entry to practice place for every new nurse. Q. What do you think are the characteristics of a good leader? And are they intrinsic or can they be learnt? A. My favourite quote about leadership comes from Dr Cornel West, a Professor of Philosophy whose career has spanned Harvard and Princeton: “If your success is defined as being well-adjusted to injustice and well-adapted to indifference, then we don’t want successful leaders. We want great leaders – who love the people enough and who respect the people enough to be unbought, unbound, unafraid and unintimidated to tell the truth”. These are characteristics which can acquired, through practice, by some. Q. What do you do to try and keep fit, healthy, happy and balanced? A. I have recently become a runner. This year I entered the 10km race at the Wellington Marathon, as part of the Capital & Coast DHB Team. I was chuffed to finish 77th out of 1,105. Our team came third overall and raised $4,000 for the Heart Foundation. Q. Which book is gathering dust on your bedside table waiting for you to get round to reading it? A. There are two books gathering dust there – Maire Leadbeater’s Peace, Power & Politics: How New Zealand Became Nuclear-Free, and The Chimes by Wellington author Anna Smaill. I confess that when it comes to novels, I’m one of those time-poor individuals who lets the Man Booker judges do the searching. The best book I’ve read this year, however, is Naomi Klein’s This Changes Everything: Capitalism vs the Climate, which is now a feature documentary. It was timely, as delegates at our AGM last month voted that NZNO should support fossil fuel divestment. Q. What have you been reading instead? A. In week two of my new role, sadly my reading seems to be governance manuals, terms of reference, financial statements and previous minutes. Q. While waiting in the supermarket check-out queue which magazine are you most likely to pick up to browse and why? A. I sometimes despair at the New Zealand media landscape. The only magazine I’m likely to browse at the check-out – for intelligent commentary, fashion and more – is Rolling Stone. Q. What are three of your favourite movies of all time? A. Selecting three all-time favourites would be too hard. But my top three from the last year are Selma, Testament of Youth and The Dark Horse. Thanks for asking!